I think we need to redefine fundraising if we want to create an internal culture that will support philanthropy. When you redefine “fundraising” into other words like Friendraising, Engagement, Philanthropy — then new pathways seem possible! Here are five steps to get board members and colleagues to buy in, support fundraising, and even help out. 1. It’s an attitude thing. 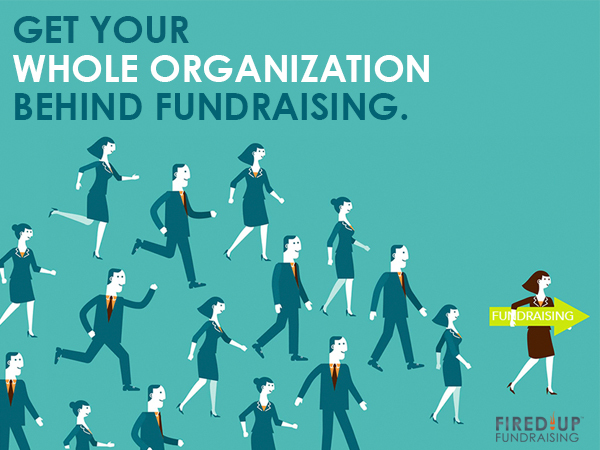 People inside your organization probably have weird attitudes about fundraising. And if they think this, then they see fundraising as distasteful and yucky – and they don’t want to get involved. They may think if they get involved in fundraising, then you’ll be asking them to call people and ask for money. And that’s the last thing they ever want to do! So, you are dealing with an attitude thing – people’s thoughts and their feelings. And if you want to create change – remember you have to meet people where they are, and slowly start to land different ideas in their heads. 2. Redefine Fundraising into something broader and bigger called Philanthropy. 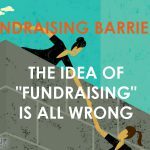 “Fundraising” can put people off. They stay away. The idea of “philanthropy” feels grand and lovely. It carries with it a sense of nobility – of helping your fellow man. “Philanthropy” can attract people. They want to get involved. If you redefine fundraising into the more lofty concept of philanthropy – you open people to to new possibilities. 3. Redefine Fundraising by focusing everybody on thanking your lovely donors. Thanking donors should be an easy job. And it’s the right thing to do. Everybody in your organization just might embrace creative ways to thank your donors. This is the fun stuff if you ask me! Board members often really enjoy saying thank you. It’s the perfect place to get them started in fundraising. Try a thankathon! 4. Focus everybody on engaging your lovely donors. Just think how much fun you could have if you got the entire organization actively engaging with your donors! How can you engage donors with your mission? Give them tours. Invite them to panel discussions. Ask them to volunteer. Ask them what they think! Share stories about your organization’s work. Donors love to hear more about how they are making a difference through YOU. 5. Focusing Everybody on Friendmaking. Here’s an idea that helps people really “get” the true essence of fundraising: Focus on making FRIENDS for the cause. What if you told everyone in your organization that we were going to tackle friendraising in your community? But, you say, How would that help fundraising? You really do want as many die-hard supporters as you can possibly get, don’t you? And if you have die-hard, passionate supporters, what will they do for you? They’ll do whatever they can for you. They’ll contribute money when they can. Somehow when you focus your people on friend-making, their fears about “money” and “asking” start to fade. Board members in particular often find inspiration in this idea – and it ignites new energy. If you want to create a culture of philanthropy at your organization, start here. It’s a kinder, gentler, more fun and much more successful way to gain sustainable support from your donors. For more on building a culture of philanthropy, check out this report: Beyond Fundraising: What Does It Mean to Build a Culture of Philanthropy by Cynthia Gibson. 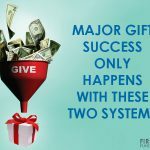 Building an Internal Culture of Philanthropy to Support Major Gifts Takes Time and Effort!